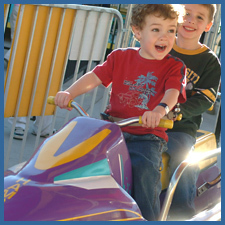 Rides are subject to height restrictions set by ride manufacturers for your safety. HEIGHT RESTRICTIONS: Child under 42" tall must be accompanied by paid adult. Child under 1 year rides free with paid adult. Listen - what's that noise? It's a train horn, inviting you to come aboard! 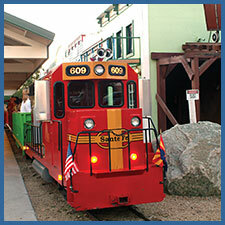 Climb onto Freestone's 1930's era train, and hold onto your hat in one of the open-air coaches. Or enjoy the shade in a covered car. The streamline Sante Fe Style Engine pulls coaches loaded with happy rail travelers of all ages on a scenic three-quarter-mile journey around the park. HEIGHT RESTRICTIONS: Child under 42" tall must be accompanied by an adult who may ride free standing next to the child. Child under 1 year rides free with paid adult. It's awfully tough to choose your favorite from the 30 beautifully carved ponies on Freestone's Allan Herschell antique carousel. This refurbished 1951 carousel casts a spell on riders young and old alike, with lights, music, and of course, its prancing painted ponies. 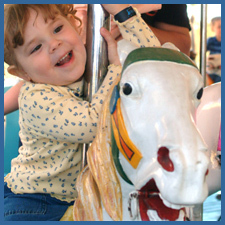 Ride with your children on one of the most beautiful carousels in the Southwest. It's old-fashioned fun at Freestone! HEIGHT RESTRICTIONS: Must be under 48" tall to ride. 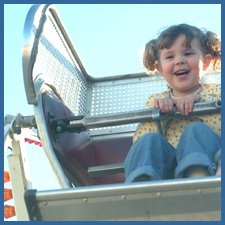 Your child will soar to new heights on Freestone Railroad's mini Ferris Wheel. Especially designed for young children, the wheel gently lifts riders high enough to wave at the engineer on the railroad, the horses on the carousel, and even the ducks on the lake! HEIGHT RESTRICTIONS: Must be under 54" tall to ride. Catch A Wave - without Water! No need for a trip to the beach, because the best waterless wave ride is right here in the desert! Kids get to zoom around on a realistic-looking water ski cycle, parents get a great photo op, and everyone stays dry! Gilbert's Freestone Park also has picnic tables, playground areas and lots of other outdoor activities for a full day of fun! Visit the Depot Snack Bar for a frosty soda or delicious food treat. Relax and enjoy your meal at the lakeside patio.